Thanks to all the rubberfans and funkateers who came out for (the last?) MUM this weekend! Brother Cleve, DJ Flack, Wayne&Wax, DJ Axel Foley, Dziga, Tdogg, yours truly and all the other people who volunteered their time and gear cooked up a proper P-Funk tribute all slathered up in rubbery bass, screwy syths and more bounce for your flashlight. There is nothing like dancing in the street with a few hundred of your new best friends to make you feel good about the world. Here’s some video of my set that gives you a sense of the vibe this year. DJ Pace @ MUM 2010 from Carey Foster on Vimeo. Thanks to the Somerville Arts Council for getting the community together to dance in the street.Those from funkier locations may think this sounds insane, but up here in the brainy Northeast, its often hard to get people dancing period. Forget about throwing a legal family style p-funk tribute dance party under a highway overpass. Despite the odds, that’s what we have done for the last 5 years. This year the bass was so heavy and the funk so stanky that it made me want to take the show on the road. I kept wondering, “could a traveling caravan throwing outdoor electro-boogie-disco-breaks parties unite the country? The world?” Under a bridge in Somerville, MA this weekend, it sure seemed like it could. Although the video clip above does not make it so clear, every year we rock together. Here’s a clip from last year with all of us on deck. One nation under a groove. Under a bridge. Folks, what can I say. I had so much fun at the All American City Beard and Moustache Contest this weekend that I had to share some YouTube links pics and stories! Not only was it packed with supportive onlookers and fans, the facial creativity was in full effect (as the videos will attest). 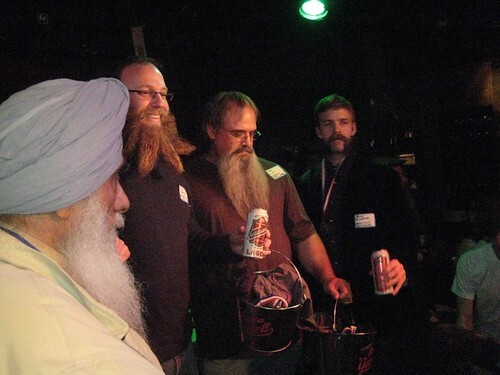 Two particularly awesome moments included the 12 year old kid with the barely started fuzzstache who won second place in the mustache contest and the elderly Sikh gentleman who won in the natural beard category with his wonderful whispy white beard. So great! Somerville was certainly showin’ the love this Sat. Along with all the nice community feeling, it also gave me an excuse to play some classic rock tunes and drink free Naragansett tall boys in the afternoon. What could be better? 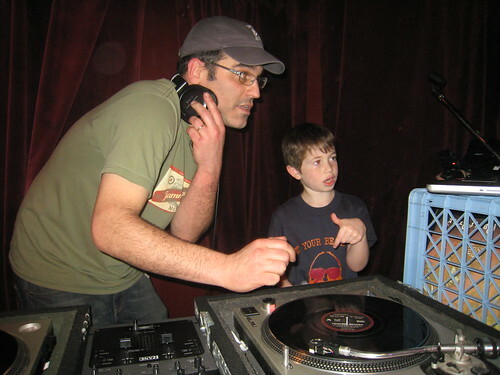 Well, how about an impromptu DJ lesson for the kids to wrap it all up? I have often noticed this when I play family style events. The kids always seem fascinated with the DJ rig and often come up wanting lessons. At one wedding, I was literally swarmed with a ring of Lilliputian onlookers all decked out in their finest. Of course, being a teacher at heart, I am always glad to mess up the mix to explain the technique to inquiring little minds. All in all, a pretty sweet weekend. Hope to see you all next year. 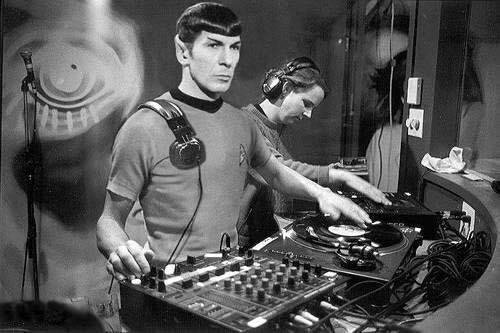 I’ll be spinning a rare afternoon set at Precinct in Union Sq. Somerville tomorrow, Feb 13 from 3-6. Its a facial hair party/competition, so expect plenty of classic beard rock (ZZ top, Allman’s, Steppenwolf, etc) sprinkled into my regular sonic salad. I’ll be getting itchy and scratchy all afternoon. I know some of my local people just culled, but come represent even if you are bald faced by choice or necessity. Whatever your follicular situation, come give the hirsute among you some love! In this age of increasingly plastic people, you know we need it. A contest & party sure to tickle your chin. Previous contests have been held in other parts of the world but nothing like this has happened in your own backyard. Jimmy DelPonte will emcee; a panel of bearded judges will issue the verdict; and DJ Pace will create the scratchy sonic backdrop. We will nibble, drink and hob-nob within a roomful of artistic facial hair. What better way to spend a winter afternoon? Contestantswill vie for prizes in 5 categories: natural full beard, free-style full beard, free-style moustache, free-style partial beard, (which includes goatees, sideburns and any other creative combination of the above), and for follicle challenged, best fake beard. To register/questions: GetYourBeardOn@gmail.com Co-produced with Todd Easton. Here’s a little youube to get you in the mood. Reminds me I might want to bring some classic Greek Orthodox tunes too.